Every artist needs feedback and critiques to improve. It always helps to get a fresh set of eyes on your artwork because others tend to see mistakes that you’ve completed overlooked. If you’re studying in the classroom you’ll naturally find encouragement and critiques circulating from your peers. But what about working by yourself? Yes this does get lonely, but it’s also hard to find valuable critiques. This post will cover some of the best communities you can use for getting critiques online that will actually help you improve. The last part of that sentence is crucial because it’s easy to just get someone’s opinion on your art. But it’s another thing to have an educated artist point out unseen flaws in your work. The largest social news sharing website is also a great place to gather critiques on your work. Reddit works by splintering into different communities called subreddits. You can find dozens of art-related subs with /r/ArtCrit being a large one for critiques. 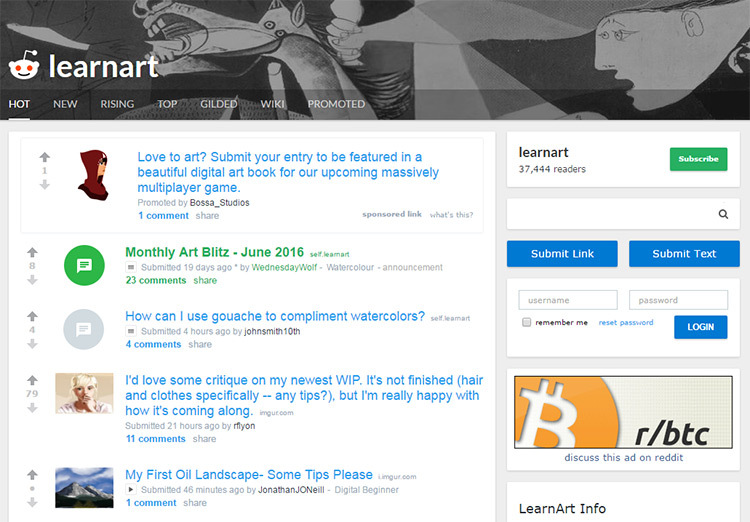 I also recommend /r/LearnArt because it has a larger community and a much more active userbase. If you’re already past the fundamentals and want serious critiques on your concept work then check out /r/ConceptArt. It’s a community of artists dedicated to the craft of concept art. Many people share their work on the sub and most readers are willing to offer their feedback. You may also know about the free Drawabox lessons online. That whole drawing course initially started on the /r/ArtFundamentals subreddit. The creator of Drawabox runs the sub and the website answering live critiques for student work. If you’re willing to post your work in one of the discussion threads you can get live critiques from the artist who started the entire course. It is absolutely the best way to get free progress critiques. He only offers to critique your homework for the course, but you might push your luck by asking for critiques on personal projects. The Pencil Kings community is massive and full of artists from all backgrounds. But this site only offers a private community for dedicated artists. You get access with a monthly subscription to Pencil Kings which offers the massive community + premium courses on art fundamentals, illustration, and concept art. Pencil Kings is full of artists with varying skill levels and the community is crazy useful for gathering critiques. You can post your work or start a new thread on any general question you want. Other community members can share their thoughts & offer critiques on your work. Not to mention you can browse through all of the community archives to check out the older threads. Pencil Kings is a goldmine of information and you’ll be getting critiques from many professional artists too. If you can afford it then definitely give this a try. It comes with 400+ HD videos on every topic imaginable so it’s a great resource for getting critiques and learning on your own. Check out the Pencil Kings signup page for more info on pricing & what you get with an account. The largest community of concept artists has to be ConceptArt.org. It’s full of artists from all backgrounds and skill levels who share their opinions and critiques. The forums have a special art critique section where you can get critiques on your work, and where you can critique others. This helps not only improve your own art but improve your eye for catching mistakes in other’s artwork. If you want to pursue concept art or entertainment art then it’s worth registering an account here. The site is totally free and you can learn a lot from the diverse userbase. 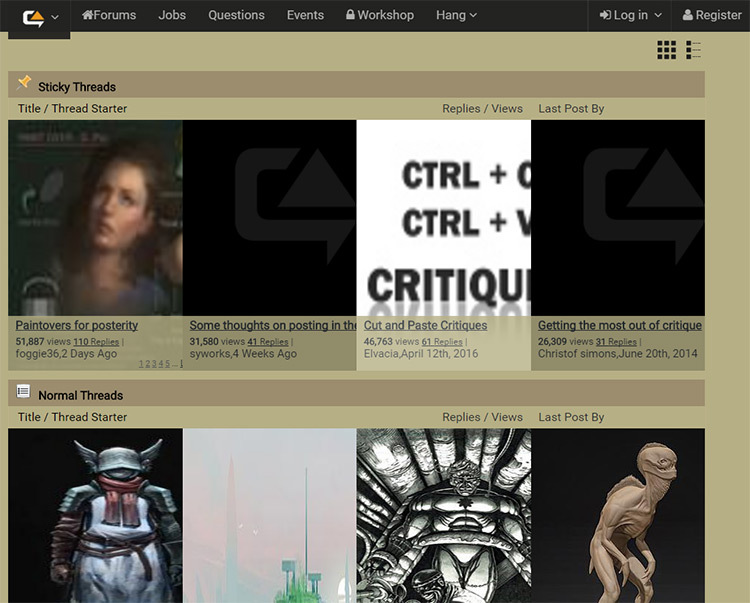 The most popular forum section is the sketchbooks area where users can post small sketches and portfolio pieces. It’s a core part of the community and most members keep their sketchbook link in their forum signature. Other great forums include CGTalk and Polycount, but neither community is as large as the ConceptArt.org community. They are great alternatives if you’re looking for something a little smaller with a close-knit group of regular posters. 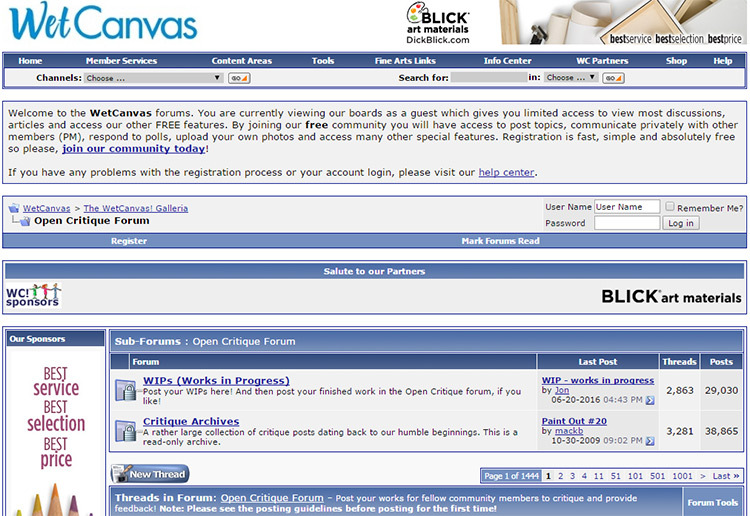 The WetCanvas website is primarily a forum community for artists. The site is geared more towards traditional work, but it’s still a large enough size to be on the map for online critiques. This site also has its own critiques section just like the ConceptArt.org forum. WetCanvas isn’t hugely populated but it is still active. The quality of content and replies are also very high which means you can expect opinions that actually help you improve. If you find enough value in the Concept Art forums then I wouldn’t even bother signing up for WetCanvas. However if you’re really into traditional work and need comments on your fundamentals then WetCanvas will help a lot. I can already hear faint screams of disgust through the monitor so I’ll keep this one brief. 4chan is generally the worst site to go for any advice or quality discussion. It’s an anonymous message board with individual boards dedicated to certain topics. 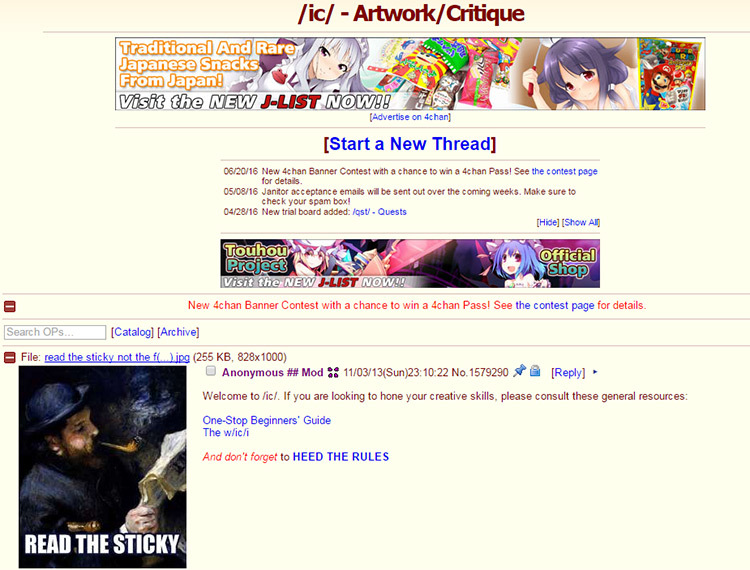 But one of the boards called /ic/ is titled Artwork/Critique and it actually has a decent community. The entire board is dedicated to artwork and how to improve as an artist. I’ll be the first to say it’s not the best community to just hang around—but in terms of 4chan boards, it’s far from the worst. Plus if you start a new thread and post your work you’ll actually get responses. Many of them will be vague and useless, but there are some skilled artists on the site that can help. The best thing about anonymity is that it frees up everyone in the conversation. You don’t need to put your name on anything so you can post anonymous practice work for critique. Plus anyone responding can feel free to tear it apart because they don’t need to spare your feelings. If you want to completely avoid the 4chan community altogether I wouldn’t blame you. But with so few online crit communities I felt the need to include this one, only because sometimes you really can get valuable advice. This last tip isn’t about a website but it is a way to gather critiques online. If you reach out and network with other artists you may be surprised how many of them are nice enough to chat. You can get suggestions for books, tips on drawing/painting materials, and maybe even a mentor to help critique your work. Now I’m not suggesting that you go out emailing every great artist you can find. People are busy and they don’t want to critique the work of a complete stranger. But if you’re nice enough and can build a decent online connection with other artists then you might be able to building lasting relationships. The best way to do this is to get your work out there online. Join DeviantArt and setup a profile. Share your work on Twitter or Tumblr as well. All of these networks have thousands of artists who also share their work freely, so it’s super easy to meet other artists in similar positions as yourself. If you’re an all-around great person and genuinely willing to learn then you’ll have no problem finding critiques. Just be sure to put in the work and get to a point where your artwork actually benefits from the eyes of another artist.